Thousands have expressed outrage over the treatment of Ahmed Mohamed, a 14-year-old Muslim student at MacArthur High School in Irving, Texas, who was arrested after trying to show his English teacher an electronic clock he had constructed. The principal as well as mayor Beth Van Duyne (who has previously appeared on Glenn Beck to discuss her fears over sharia law) have defended the actions of the school and police. But critics have speculated that neither the school nor police ever actually believed Mohamed had a bomb and that this was really a case of bigots humiliating a Muslim student under the pretense of public safety. This critique raises important questions about the mechanisms of moral panic. Is it necessary to believe in a threat to take action against it? Mohamed showed his clock to his engineering teacher, who warned him not to show it to anyone else. But when the clock began beeping during English class, Mohamed revealed it to his English teacher, who alerted the principal. In Mohamed’s version of events, the principal arrived accompanied by a police officer. He was taken to an empty room where a group of police interrogated him for an hour to an hour and twenty-five minutes. During this time, Mohamed was not allowed to communicate with his parents or an attorney. Following the interrogation, Ahmed was escorted from the school in handcuffs. He was taken to a detention center, fingerprinted, and later released to his parents. All criminal charges were eventually dropped but he still received a three-day suspension from school. As critics have pointed out, the school’s response was not consistent with a bomb threat. If MacArthur is anything like public high schools I have worked at, there is a contingency plan for bomb threats. In 1999 5% of bomb threats were directed at schools. Frequently, these threats are made by immature students who want to get out of an exam. But no matter how unlikely the threat is, all students are evacuated and the bomb squad arrives to do a sweep of the building (a very expensive procedure for the tax-payers). Neither of these steps were taken over Mohamed’s clock. During the interrogation, the police repeatedly asked him if his clock was a bomb. But if they had any suspicion the clock might actually be a bomb, they would not have sat in a room with it for an hour. Significantly, the police charged Mohamed with “possession of a hoax bomb.” Mayor Van Duyne made this distinction as well. 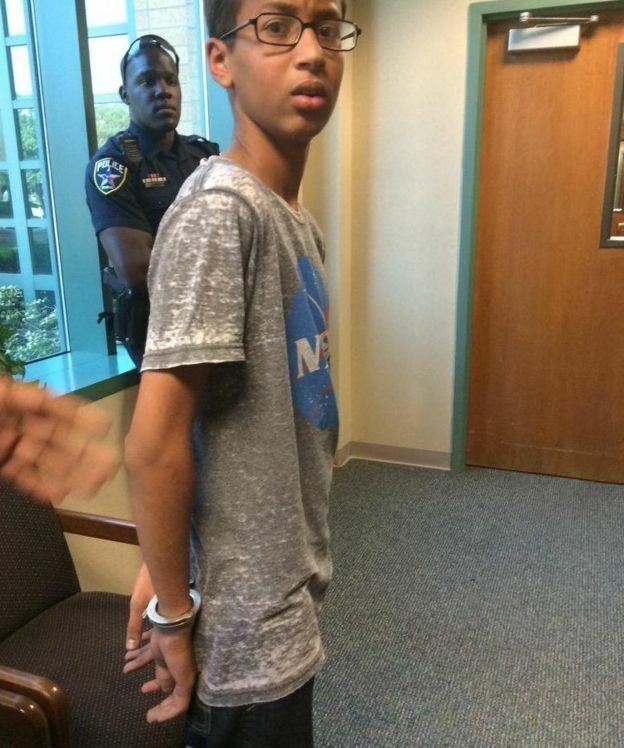 It is at least conceivable that Mohamed––who has been bullied about terrorism and bombing since middle school––decided to play on a prank on the bullies by showing them a homemade clock (which he had built into a large pencil case resembling a briefcase), knowing it would make them nervous. But if this were Mohamed’s intention, he would not have showed the clock to his engineering teacher first, or concealed it when advised to do so. More importantly, the school’s response was not consistent with a hoax bomb: Schools and police normally treat hoax bombs as real bombs until proven otherwise. Although school officials have claimed their actions were necessary to maintain “an abundance of caution,” much more caution could have been taken. In a press conference, Irving Police Chief Larry Boyd announced, “The follow-up investigation revealed the device apparently was a homemade experiment, and there’s no evidence to support the perception he intended to create alarm.” He explained that under Texas law, a hoax bomb is defined as a device that is “intended to cause anyone to be alarmed or a reaction of any type by law enforcement officers.” This legal situation is significant because the question of whether a crime was committed revolves around such intangibles as belief and intention. Note that the burden of proof does not fall on the school officials to prove they sincerely or reasonably believed Mohamed had a bomb, but rather on Mohamed to prove he sincerely did not mean to alarm anyone. Ultimately, no one can prove what other people believe or intend. However, I don’t think that school officials or police ever sincerely believed Mohammad’s clock posed a threat. I also don’t think school officials or police made a conscious decision to falsely accuse Mohamed of a crime. This may have been a case of Kafkaesque bureaucracy in which no one wanted to be accused of a lack of diligence: The English teacher knew the clock wasn’t a bomb but called the principal just in case; the principal knew the clock wasn’t a bomb but summoned police just in case; and the police, having already arrived, felt they ought to charge Mohamed with something. What this amounts to is something like an imaginary play world that is constructed collectively and imposed onto reality: The clock was both a bomb and a clock simultaneously, much as a child at play can regard a banana as a both a banana and a phone simultaneously. Specifically, the narrative created around Mohamed’s clock is what ludologist Roger Caillois called “corrupted play” because, unlike normal play, it has serious consequences beyond the play world. I also think that this sort of corrupted play occurs most often in association with moral panic. Moral panic, is described by Stanley Cohen a social situation in which a particular group or social phenomenon comes to be seen as a threat to societal values and interests. The threats described in moral panics are usually greatly exaggerated or, as with claims of witchcraft and Satanic cults, may not exist at all. Religion scholars know that “belief” does not consist of a set of either/or propositions. It is possible to hold multiple, even contradictory beliefs, and we “believe” different things in different ways. It seems that when a community has been primed to feel it is under attack by hidden forces, it is more likely that these competing forms of epistemology will blur together. When this happens people may receive real punishment for imaginary crimes. Before the events of September 11, 2001, ushered in a new age of Islamophobia, the Columbine shootings of 1999 inspired a moral panic that “dark teens” might suddenly snap and carry out a school shooting. Since Columbine, school children as young as five have been suspended for possessing or even talking about such harmless objects as pink Hello Kitty guns that dispense bubbles, Pop-Tarts that have been bitten into the shape of a gun, chicken-nuggets, and imaginary grenades. Many of these incidents have outraged the political right, just as Mohamed’s arrest has outraged the left. Presumably everyone involved in these suspensions understood these objects could never be dangerous, and yet removing the symbol of a weapon was somehow expected to prevent violence. What was his Eminence’s real opinion of witchcraft and possession? . . . The best answer, I would guess, is that, when he felt well and was in the company of laymen, the Cardinal regarded the whole affair as either a fraud, or an illusion, or a mixture of both. If he affected to believe in the devils, it was solely for political reasons. . . . True, an innocent man had been tortured and burned alive. But after all one can’t make omelettes without breaking eggs. And anyhow the parson had been a nuisance and was better out of the way. But Huxley goes on to speculate that Richelieu probably did believe Grandier was a sorcerer at other times, especially when his health problems flared up. It is possible for seemingly contradictory beliefs to be “true” in different ways. What the case of Mohamed’s clock demonstrates is how easily beliefs can slip between different epistemological frames such that ideas that are not reached through empirical observation are acted upon as if they were. This slippage seems especially common where conspiracy theories and moral panic are concerned. Claims that daycare providers are actually Satanists or that operation Jade Helm is actually a plot to declare martial law seem to exist in a liminal state between fantasy and perceived reality until we decide to act upon them. Similarly, when terrorism, “dark teens,” or witchcraft are involved a policy of “taking no chances” can elide into equating imaginary threats with real ones. Joseph Laycock is an assistant professor of religious studies at Texas State University. His most recent book is Dangerous Games: What the Moral Panic Over Role-Playing Games Says About Play, Religion, and Imagined Worlds (University of California Press, 2015). This entry was posted in Joseph Laycock and tagged Ahmed Mohamed, Aldous Huxley, Beth Van Duyne, Cardinal Richelieu, George Orwell, Glenn Beck, Jade Helm, Larry Boyd, MacArthur High School, moral panic, Roger Caillois, Stanley Cohen, The Devils of Loudun, Urbain Grandier. Bookmark the permalink.